In Ancient Egypt the Judgement of The Dead took place in the Hall of Maat. Maat is often called the keeper of the Scales but she is The Scales. The newly deceased was led into the Hall by Anubis, The Opener Of The Ways and presented to Osiris. There were Assessors who asked the afterlife seeker searching questions about how they had lived their life. The subject’s heart is then weighed against the white feather of Maat. The heart must not weigh more than the feather. Thoth is present to record the outcome. 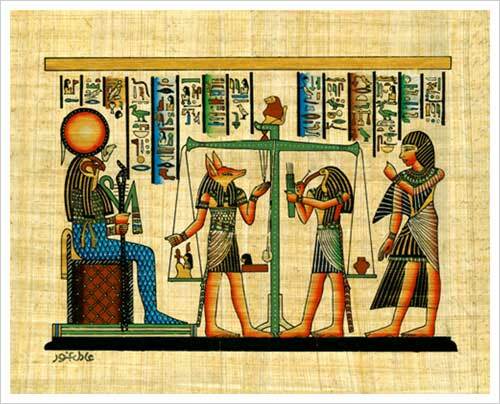 If the weight of the heart passes the test then the subject is told by Osiris that he/she has been found worthy to go to the House Of Amenti. A demon, possibly Sekhmet is also waiting to devour the heart of the results go against the individual. Why 42 questions I asked? it is the number of life I was told. The Kaballah says that God created the world by using the first forty-two letters of the Torah. So these became the forty-two building blocks or stages of creation. 1. Have you looked after your body as best as you could? 3. Have you been clean in body and mind? 4. Have you only had sexual relations with one that you loved too? 5. Have you found out information that was not meant for your ears and eyes? 9. Have you eaten and drunk too excess? 13. Have you been jealous?? 22. Hast thou repayed all debts promptly? The last question is the one that would save most people. As long as there is ONE person who is glad that the individual has lived, then the individual hits the jackalpot and is redeemed. The beauty of it is that the person could be a stranger that you gave 10 pence to when asked or that you helped to cross the road. It could be someone that you gave a seat to on the underground or that you smiled at in the street fifteen years ago who has long gone from your memory. Oh I can imagine people frowning now and saying what about murderers and the like? The answer is that I do not know as this is the Ancient Egyptian sytem from the Book Of The Dead. Perhaps, as it is in our prison system sometimes, the perpretator has to show remorse. If the candidate (as they are called) admits to their transgressions and shows remorse, maybe they are suitable to be put through to the Fields Of Amenti to be recycled.We do not know what happens there. If the heart is heavy with conscience and lies, it is devoured by Sekhmet which for the Ancient Egyptians was a fate worse than physical death. Thoth would be recording it all and presumably your very name would be erased from the chapters of history. I do not know if there is a list and if anyone was erased in this manner. The last question does seem to be a get out clause. Shall I or shall I not tell you? oh, alright. I will. My late mother and I had a challenging relationship since I was born. She passed away in hospital after catching pneumonia in there (typical story as she only went in with a broken hip) I went to see her in the chapel of rest with my father as he wanted me to accompany him. I lit some candles and began to do an ad hoc Egyptian type ritual. I have always been able to do an ad hoc ritual. I took an Ankh from my keyring and placed it in her hand and said “You will be asked a series of questions about how you conducted your life on this earthplane. The last question will be “Is there anyone that is glad that you have lived?” I gave the Ankh to her and said “You can say that I was and this is the proof” It was cremated with her. It comforted ny father and he asked me if I can do the same for him when he eventually passes over as he wants to go to the same place as her. I have promised him that I will and we went straight out and brought him an Ankh which he keeps in a box for now. Imagine having to answer all of those searching questions. The heart would only be light for the weighing process if your conscience was clear you see, which is why it was important to evaluate your life honestly. As an end of the year exercise you could do a kind of stocktake of your life to see how you do. I suppose you could use these questions in a party game in a kind of Truth or Dare, Spin The Bottle kind of exercise. I hope that you find the questions interesting and it makes you do a quick inventory of your life. This entry was posted in Ancient Egypt, SOW School Of Wyrdynamics and tagged Ancient Egypt, Death, Maat, Magickal Working, Sekhmet. Bookmark the permalink.